Mercy is, of course, continuing the conversation with Sophie from last page. As usual, you can show your support for what we are doing (and get an EXCLUSIVE sneak peek) by voting for Autumn Bay on Top Web Comics. 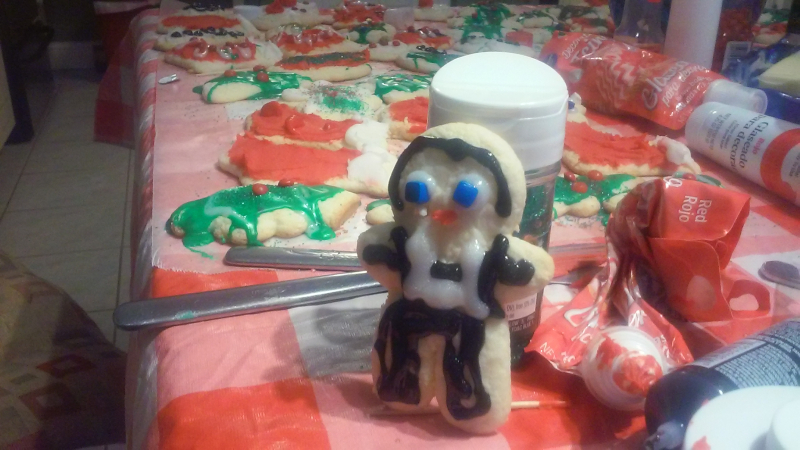 And here is an Autumn Bay holiday treat: Mercy in cookie form! Choice things are her things of choice. Come on, Prof, y'all know better than that--cookies made to look like humans are bad voodoo. Oh, my good sir, you mistake the source of cookie magic. That dates back to Rome and the ritual "sacrifice" of human-shaped biscuits during Saturnalia. Unless I am mistaken, this is the true origin of gingerbread men. Also, excellent use of the profile in panel 3! Thank you! I was looking for "dramatic beat" with maybe a dash of mystery. I'm glad she's coming across so well! She is the first character here who both has a clue about what's really going on and has the freedom to chase it down. Some archetypes are unavoidable, and it's not cheating if some character seems to fall into one. Besides, this is another case of "Eye of the beholder", since people will read into situations what they expect to see. "The plot thickens" ...like gravy! Like yummy, yummy holiday turkey gravy! "Mercy is my name--not my inclination." In time. She has legwork first. Really like the design for Mercy, especially her eyes. That's a terrific eyeshadow weffect that looks both ominous and world-weary. Looked up 'deadpan' in the dictionary. I was surprised it merely had a definition of 'deadpan', and not a picture of Mercy. That "advanced age" bit is KILLER. Glad you liked it! Their banter is fun to write.